slabs. The lanes are about 20 feet apart. Target bales are one foot off the ground and sit on wooden stands. 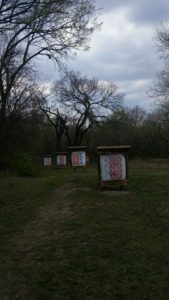 The target areas for the 15, 20, and 30 yard targets are approximately four feet square; the target area for the 40 yard target is roughly 4 feet wide by 6 feet high. 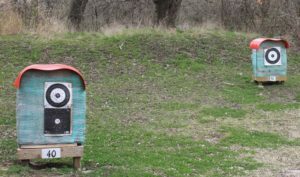 The shooting line can accommodate two archers shooting at each target, so eight people can use the range at the same time. Two bow racks will soon adjacent to the pads. 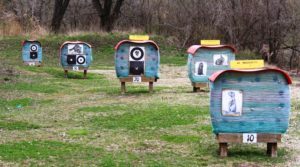 3-D targets of deer and turkey are available to BSC archers. A raised stand approximately 12 feet above ground is currently being refurbished to ensure safety. The stand is accessed by ladder. There is a rope and pulley available to raise and lower bow and arrows. 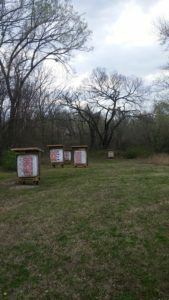 The Archery Targets were rebuilt in 2018 with covers over the bails to protect them.